From the kitchen of One Perfect Bite...These truffles have been on my "must try" list for ages. I've had no time to test them, so the recipe sat in a folder where it was beginning to yellow with age. I finally got to them last night and I'm delighted to tell you they are fabulous. I'm not an experienced candy maker. Fudge made with marshmallow cream has been my only other excursion into the realm of candy making. I can now add truffles to my list. These are really easy to make and I hope, with a bit more practice, I'll be able to make them as pretty as they are delicious. They should be served cold. If you're fond of white chocolate, you'll love these. 2) Place butter and 5 tablespoons cream in a 1-quart saucepan; slowly bring to a boil, stirring constantly. Boil for 1 minute. Remove pan from heat. Add 8-ounces of chocolate chips to cream. Stir until melted. Stir in orange liqueur. 3) Pour mixture onto prepared pan and refrigerate for 2 hours, or until firm. 4) Use a knife to score chocolate into 20 approximately equal pieces. Roll each piece into a small ball. If mixture becomes too sticky to roll, chill for a few minutes before proceeding. Transfer balls to freezer for 1 hour. 5) Melt reserved 4-ounces of white chocolate with 2 tablespoons cream. Dip balls in melted chocolate. Place on nonstick paper and quickly swirl top with a fork. Let harden. Serve cold. Yield: 20 truffles. 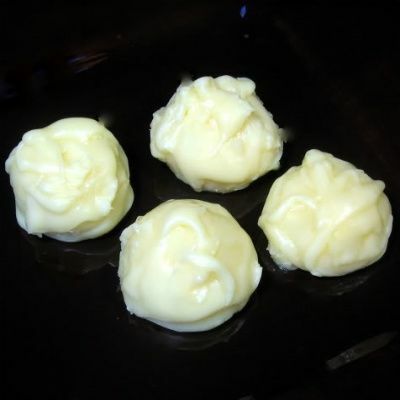 OH MY GOSH girly these white chocolate truffles look amazing. I love making candy, I need to get up on it, thanks for giving me a shove. I love white chocolate but have never made white truffles. I shouldn't but next time I go to the market I may just have to put a bag of white chips in my cart! This is absolutely an easy one. I've to try this. Wow... white orange liqueur! This is so good! Your truffles look wonderful. I've only made truffles once and it was a very long time ago and I used a Julia Child recipe for dark chocolate ones. You've made it look easy - thanks. I bet they're delicious!!!! Y'know the first time I ever tasted white chocolate I was overwhelmed with surprise...I, in my mind, had the taste expectancy of divinity...and it was CHOCOLATE! Happy Tuesday to you Mary. mmmmm. I would definitely love these...orange w/ white chocolate is an amazing combo! All right, I'll try just one, thank you. I'm afraid if you set them too close, I just might have to have two!! Your truffles look gorgeous Mary. I love the addition of orange liquer,it must put the wite chocolate flavor over the top. Wow they look great can't wait to try love the white chocolate. Those look seriously easy and very elegant. I really enjoy your recipes for this reason. I'll be printing this one too. I love that there is just a few ingredients. I love white chocolate and truffles so this would make me a very happy woman. My but you have been busy. I can't keep up with your posts. The truffles look positively decadent! And they sound fairly easy. Will give them a try. Thank you. They sound easy and DELICIOUS! Will be great to add to a box of candy at Christmastime. How beautiful would that be? Just exquisite! they must be kept cold. I like the addition of the orange. MMMM. When I was a kid I didnt like chocolate I liked white chocolate. Things have changed but I still like white chocolate. These look yum. Yellowing pages and you come up with a white chocolate beauty like this . . . they even appear fairly straight forward to make. Wish I could try one of yours. Oh with the orange is very, very nice! I love the creamy color too. These look super wonderful and sound so very easy to make.